Re: Rockwell/Panavia F-24 Tornado "Wild Weasel"
Already liking where you're headed. As has been observed, the Tornado really needs a bigger fin! Just what a Tornado needs, a bigger fin! Looking great, can’t wait to see more. Now I kind of want to get a Tonka and turn it into a F-24 of the 316th fighter interceptor Squadron. Yes, well, I'm broke, we don't have the money to spare, and Mrs. NightHunter would kill me if I bought another model right now. I also might have to reduce my stash till her paychecks start coming in on the regular. Also, when did the group build start? I think the 1/144 Revell Tornado can be had for about £4, but at that scale you will need better eyesight and hand/eye coordination than I have. I have myself been through the forced stash reduction process but courage, mon brave, it gets better eventually. Domestic harmony is of huge importance, not upsetting the other half is part of the PRIME DIRECTIVE. I too have had times when Madame Rheged would have wished either instant taxidermy or cremation upon me if I'd spend ANY of the Imperial Treasury on anything but food and the mortgage. For us, things are vastly improved now, and I hope that they soon will be for the Nighthunters too. The theme build started just recently so you haven’t missed anything. It’s not a group build so things are a lot more flexible. I hope your finances improve soon. Been there, done that, wasn’t fun. Yup Theme Builds are far more relaxed when it comes to their organisation and don't tend to have many rules at all, if indeed they have any. Group Builds on the other hand are far more formal and far more organised. A little slow progress this week. Primer coat is on, revealing some areas that need a little attention, but honestly this kit has so many poorly fitting areas, but such nice surface detail that its hard to clean it up completely without destroying the detail. I think I am going to accept this one almost "as it" and enjoy it from 5 feet away. Some new ECM bits n bobs have been added under the nose, and new IFF antennas on top of the nose. 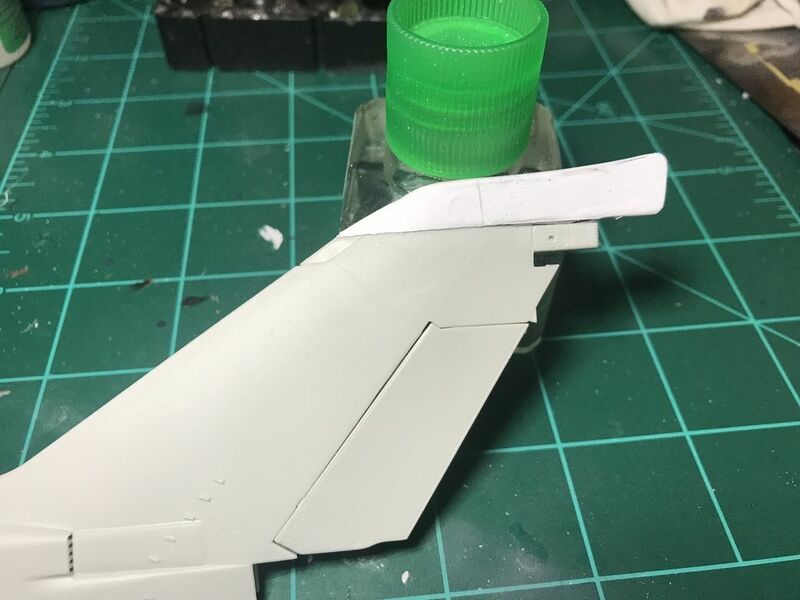 There will be an AAR port on the spine, so I'm filling the panel lines for the probe. 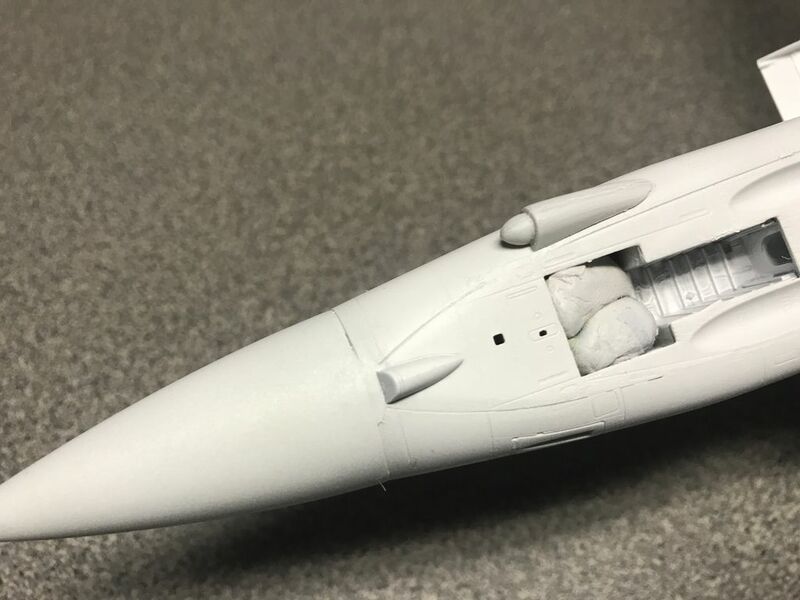 Not putting too much time into the refueling port, just making it happen through the magic of decals. 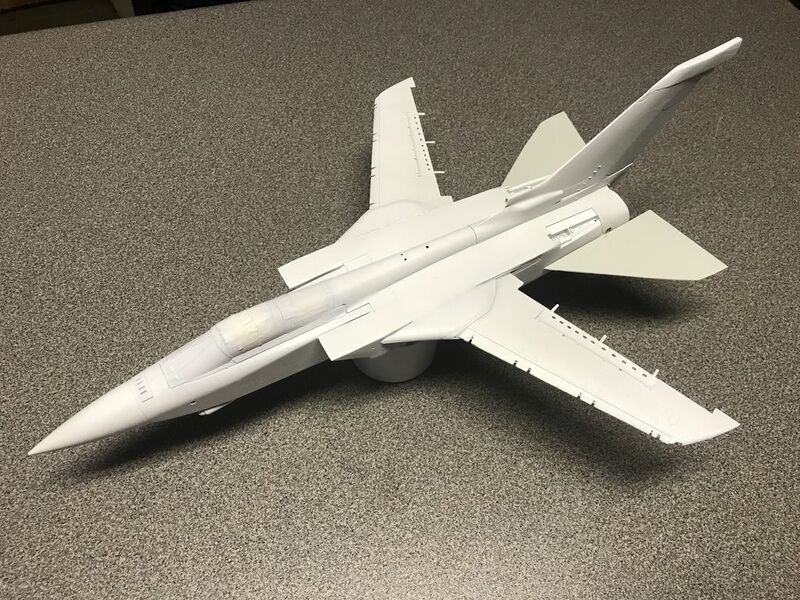 I thought about filling the Skyflash/AMRAAM bays in the forward fuselage, but decided not too, reasoning that if the F-24 used the F.3 airframe why pay more to redesign an area that results in a lost capability. A suggestion, if I may? Since you're using the F.3 radome, you can't get an attack radar AND a terrain-following radar in there - that's the reason for the GR.1's 'kinked' radome outline. The attack radar isn't really neccessary for the SEAD mission but the TFR is highly desirable, as Rockwell's proposal mentions. Why not, therefore, say that since the Wild Weasel mission doesn't require the attack radar anyway, the TFR is repositioned to the tip of the nose, and the back half of the F.3 radome is now 'tin' and full of yet more devious ECM stuff? 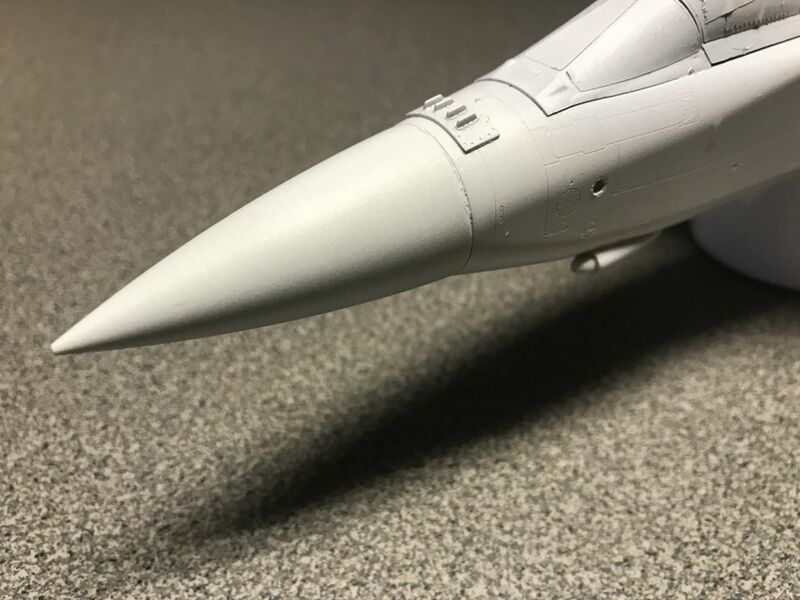 All this would require is to scribe and/or paint a smaller radome on the tip of the nose (about 1/3rd of it's length should do) and then add some more ECM bumps to the back half of the dome. Left and right RWR 'wedges' would be a good start, plus maybe a extra blade aerial and dielectric panel or two. The top of it might also be a good place for an IFR receptable, F-105/A-10 style. Another observation: the artwork in the Rockwell proposal has at least one Maverick on the fuselage pylons, which makes sense since F-4Gs used to carry attack weapons in order to destroy the SAM launchers after they'd taken out the radar with ARMs, and Maverick was a common fit. Of course your proposed 4 x HARM fit is perfectly valid, as the other artwork Kitnut617 posted shows. Changing the radome had not crossed my mind but now that you mention it I think it would really change the look of it and I like the idea. Ditto the nose refueling. I’m comfortably sitting in First Class sipping an adult beverage enroute to Vermont at a respectable 645mph currentky but may give these ideas a try next week. Thanks! Oh yeah.....that looks so yummy already !